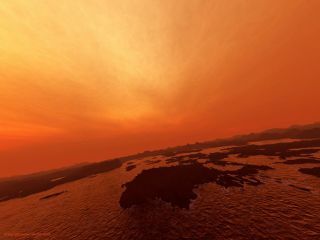 A possible view of the Titan surface with a methane sea. There's still a lot of guessing whether Titan has a lake or lakes which contain liquid fluids like methane or hydrocarbon. If they exist they will not be larger than a few kilometers as the first detailed photographs of the Cassini show us (fall/winter 2005). Terrain made with Cassini radar data. (made with the grey scale map I made from the 'shoreline' Titan radar map). Saturn's eccentric orbit might be the cause of the unevendistribution of ethane and methane lakes on the ringed planet's moon, Titan. Images from NASA's Cassinispacecraft reveal that liquid methane andethane lakes in Titan's northern high latitudes cover 20 times more areathan lakes in the southern high latitudes. Cassini data also show that there are significantly morepartially filled and now-emptylakes in the north. But why Titan showed these north-to-south differences wasn'tknown, though scientists have floated various ideas to explain the mismatch. Nowa new and potentially more plausible explanation is offered. Scientists initially considered the idea that "there issomething inherently different about the northern polar region versus the southin terms of topography, such that liquid rains, drains, or infiltrates theground more in one hemisphere," said Oded Aharonson of Caltech. But scientists didn't know of any such topographicdifferences between Titans two poles, Aharonson said. One alternative to this theory is that the differences areseasonal. One year on Titan lasts 29.5 Earth years. Every 15 Earth years, theseasons of Titan reverse, so that it becomes summer in one hemisphere andwinter in the other. According to the seasonal variation hypothesis, methanerainfall and evaporation vary in different seasons ? recently filling lakesin the north while drying lakes in the south. The problem with this idea, Aharonson says, is that itaccounts for decreases of about 3 feet (1 meter) per year in the depths oflakes in the summer hemisphere. But Titan's lakes are a few hundred meters deepon average, and wouldn't drain (or fill) in just 15 years. Seasonality also can't account for the variation in thenumber of lakes between the two hemispheres. The north polar region has roughlythree times as many dried-up lake basins as the south and seven times as manypartially filled ones. "The seasonal mechanism may be responsible for part ofthe global transport of liquid methane, but it's not the whole story," Aharonsonsaid. A more plausible explanation, say Aharonson and hiscolleagues, is related to the eccentricity of the orbit of Saturn ? and henceof Titan, its satellite ? around the sun. "We propose that, in this orbital configuration, thedifference between evaporation and precipitation is not equal in oppositeseasons, which means there is a net transport of methane from south to north,"Aharonson said. This imbalance would lead to an accumulation of methane ?and hence the formation of many more lakes ? in the northern hemisphere. This reversal should produce a reverse in the net transportof methane and lead to a buildup of the methane and ethane ? and an abundanceof lakes ? in the southern hemisphere. Aharonson and his colleagues described their theory in theNov. 29 issue of the journal Nature Geoscience.